Stunning Malta map showing the armorial crests of the Grand Masters of the Knights Hospitallers of St. John. L'Isle de Malthe Et celles de Goze et de Comino, Avec leurs ou Ports, leurs Toursou Vedetes, qu'ils nomment Casati et leurs Precipices qu'ils appelant Redum . . . 1722. A spectacular and scarce 1722 map of Malta by Estienne Vouillemont and Nicolas de Fer. De Fer's map covers all of Malta as well as the adjacent island of Gozo. Throughout the map offers exceptional topographical detail and is, in places, almost view-like. Valetta is presented in exceptional detail with individual streets and architectural structures noted. At the foot of the map three lines of images illustrate the armorial crests of the various grand masters of the Order of St John of the Knights Hospitaller. This map was originally drawn by Estienne Vouillemont in 1662 and has, in this example been updated and revised by the French map publisher Nicolas de Fer to include Grand Masters up to 1722. The 66 armorial crests cover from the Blessed Gerard (1099-1120), the first Grand Master, to Marcantonio Zondadari (1720-1722), the 64th Grand Master and 22nd in Malta. The Sovereign Military Hospitaller Order of Saint John of Jerusalem of Rhodes and of Malta (Italian: Sovrano Militare Ordine Ospedaliero di San Giovanni di Gerusalemme di Rodi e di Malta), also known as the Sovereign Military Order of Malta (SMOM), Order of Malta or Knights of Malta, is a Roman Catholic lay religious order of, traditionally, a military, chivalrous and noble nature. It is the world's oldest surviving order of chivalry. The Sovereign Military Order of Malta is headquartered in Rome, Italy, and is widely considered a sovereign subject of international law. The Knights established themselves in Malta shortly after being expelled from Rhodes by Sultan Suleiman the Magnificent in 1523. 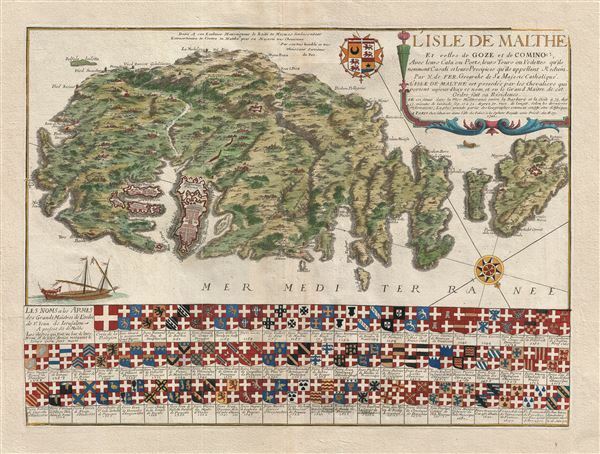 The Order remained without a territory of its own until 1530, when Grand Master Fra' Philippe de Villiers de l'Isle Adam took possession of the island of Malta. Malta was granted to the Order by Emperor Charles V, Holy Roman Emperor and his mother Queen Joanna of Castile as monarchs of Sicily. In exchange, the Order was required to provide on falcon per annum to Pope Clement VII, which became known as the Tribute of the Maltese Falcon. The map is dedicated to 'Mgr le Bailli de Mesmes Embassadeur Extraordinaire de l'ordre de Malthe, pres sa Majeste tres Chretienne.' It was included in an rarely seen 1722 poshumous edition of Defer's Atlas ou recueil de cartes geographiques dressees sur les nouvelles observations. Estienne Vouillemont (fl. c. 1650 - C. 1670) was an engraver of maps, plans, and board games active in France in the middle part of the 17th century. He held the official post of 'Graveur Ordinaire du Roy' and held a Writ of Privilege, a kind of early copyright, from the King of France. De Fer, Nicolas, Atlas ou recueil de cartes geographiques dressees sur les nouvelles observations, (Paris) 1722. Very good. Wide margins. Original platemark visible. Blank on verso. Mason, R., and Willis, P., Maps Of Malta In The Museum And Library Of The Order Of St John: A Short Catalogue, 77. Wikipedia (for Knights of St. John). OCLC: 717774085.